Las Vegas • The basketball bounced innocently onto the court after Oregon’s Kenny Wooten blocked the layup attempt of Utah guard Sedrick Barefield, and the game ended. The Utes lost an 11-point lead in less than nine minutes of a quarterfinal game that either they gave away or Oregon took from them — or both. The Ducks’ 68-66 upset of No. 3-seeded Utah late Thursday night at T-Mobile Arena was the latest example their Oregon’s reign over the Utes in the Pac-12 tournament. This was the toughest to take of them all. Oregon has beaten the Utes four times in the six years this event has been held in Las Vegas. The Ducks’ wins have come at three different stages of the tournament and by all kinds of margins. This was not like the semifinal blowout in 2013, the buzzer-beater in 2015 or the championship game rout in 2016. 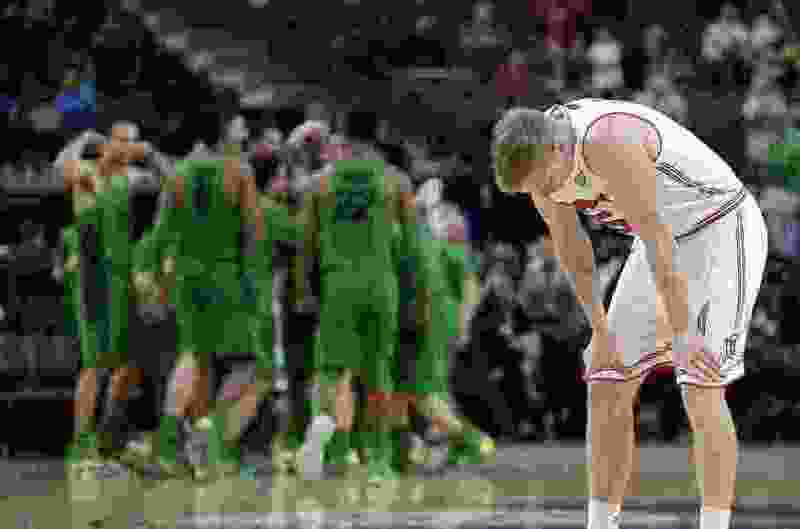 This defeat was its own story of frustration and missed opportunity for the Utes, who really believed they were capable of winning three games and qualifying for the NCAA Tournament. This episode was supposed to be different than those other games against Oregon, and certainly it would be nothing like the Utes’ quarterfinal loss to California as a rested team with a top-four seed at T-Mobile last March. Utah seemingly was the better team. Oregon was looking disinterested lately, and Utes coach Larry Krystkowiak liked the way his team was playing. In a pleasant development, Utah forward David Collette was able to play, five days after his Senior Night game was spoiled by an ankle injury. Collette was dunking and flexing, blocking shots and barking at the Ducks’ bench, and everything looked favorable for the Utes. They led 54-43 as the clock ticked inside 10:00 to play, before it all crumbled. Utah played so efficiently and effectively on offense for most of the second half, and then couldn’t score in the end. Two basic answers: The Utes became tentative offensively, after Justin Bibbins kept hitting big shots and Collette’s teammates kept dishing to him for dunks. And the Ducks kept coming, especially via 3-pointers and free throws. Blame the officiating or the Utes’ defense; the bottom line is Oregon kept going to the line. The Utes converted 13 of their first 19 shots from the field in the second half, and then missed their last five attempts, with the Ducks blocking two of them. As the game wound down, Utah’s offensive possessions looked worse and worse. The Utes had one last chance with 9.7 seconds remaining, after Oregon’s final trip ended with a shot-clock violation. So there was hope, even after the Utes’ lead was gone. Maybe this would be like the semifinal game vs. California in 2016, when Lorenzo Bonam drove for the tying basket in regulation and the Utes won in overtime. Wrong again. Barefield drove and was overwhelmed by the presence of Wooten, who didn’t give him any chance to score. And then the buzzer sounded and all the Utes (19-11) could do was trudge toward their locker room and think about playing in the NIT. Their stay in Las Vegas was not supposed to end this way, or so soon. Before the Utes’ second practice Wednesday, with his team having spent a half-hour session at T-Mobile, Krystkowiak was upbeat. Yet the outcome Thursday was the same as last March, when Krystkowiak apparently could see the bad stuff coming. The Utes lost again in the quarterfinals. The coach’s good vibes proved to be dead wrong. ‘We didn’t have enough.’ Rockets hold off gritty, but misfiring Jazz 100-93 in Game 5 to end Utah’s season.